The concept of the Trinity/ Triunity, or one God existing in 3 separate forms is one that is arrived at using something called "Systematic Theology." 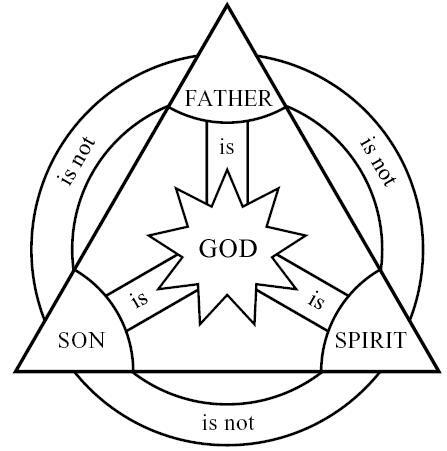 While the Bible never states that God is three separate forms, it connects the three elements of God together; the Father, the Son, and the Holy Spirit. In Hebrews 1:8, it says that the Son is God, as it does in Isaiah 9:6, John 1:1-14, 1 Timothy 3:16, Titus 2:13. This presents two possibilities, either there is more than one God, or Jesus and God are one. But in Isaiah 45:22, God makes it clear that there is only one God by saying, "I am God, there is no other." In Isaiah 45:4, he says, "I am the Lord, and there is no other; apart from me there is no God." Jesus said it most plainly, however, in John 10:30 where he says, "I and the Father are one." In Acts 5:3-4 we can see where the Holy Spirit and God are made the same, this verse reads, "...you have lied to the Holy Spirit... you have not lied to men, but to God." In Acts 28:25-26, Paul said "The Holy Spirit...said through Isaiah..." However, the Book of Isaiah says that God spoke to him (Isaiah 6:9-10). Why would Paul substitute the Holy Spirit for God, if they were not the same? In John 8:41 it says that "The only Father we have is God Himself," and in Ephesians 4:6, it reads "...one God and Father of all." So through Systematic Theology, we can see that God is the Father, who is also the Son, who is also the Holy Ghost/ Spirit. Again, we know there is only one God, and not three separate gods, so the only way for all three to exist is as one God in three separate forms/ persons. - Elohiym: One of Many, or Many of One? And he said, Go, and tell this people, Hear ye indeed, but understand not; and see ye indeed, but perceive not. Make the heart of this people fat, and make their ears heavy, and shut their eyes; lest they see with their eyes, and hear with their ears, and understand with their heart, and convert, and be healed.